On Monday July 27, at approximately 12:15 pm, Lieutenant Patrick McFerrin and Deputy Victoria Hatcher responded to the 4300 block of Clyde Morgan Road in reference to a possible disturbance. Upon arrival, the Reporting Person reported that she has been receiving threatening text messages from a subject. On Monday July 27, at approximately 1:41 am, Deputy Greg Wilson made a traffic stop in the 1500 block of Kell. The 41-year-old male driver was issued a citation for Driving While License Invalid. On Friday July 24, at approximately 7:13 pm, Deputy Jeff Penney and Deputy Christopher Salas responded to the 3800 block of Barnett Road in reference to an Assault. Upon arrival, the Reporting Person reported that a subject pointed a handgun in the direction of her vehicle and fired two shots while traveling in the area of Church Camp Road and Peterson Road. On Friday July 24, at approximately 4:30 pm, Deputy Kristian Valdez and Deputy Cole McGarry responded to the 5700 block of Fulfer lane in reference to a Terroristic Threat. Upon arrival, the Reporting Person reported that a subject has been sending her threatening text messages. On Friday July 24, at approximately 11:30 pm, Deputy Greg Wilson responded to the 1600 block of 11th Street in reference to a subject that jumped out of a moving vehicle while travelling on U.S. 287. Upon arrival, the Reporting Person reported that the subject got into a verbal argument and then jumped out of the vehicle. The subject was released to the custody of a relative. On Saturday July 25, at approximately 2:20 pm, Deputy Patrick Bradford and Deputy Jeff Lee responded to the 100 block of Wellington Lane in reference to an Identity Theft. Upon arrival, the reporting Person reported that an unknown person(s) opened seven bank accounts using her identifying information. On Saturday July 25, at approximately 9:18 am, Deputy Victoria Hatcher made a traffic stop in the 3000 block of F.M. 369. The 21-year-old female driver was issued a citation for Fail to Stop at Stop Sign. A 21-year-old male passenger was placed under arrest. He was transported to the Wichita County Detention Center and was charged with Possession of Marijuana under two ounces. On Saturday July 25, at approximately 10:18 am, Deputy Lance Brumley and Deputy John Warner made a traffic stop in the 3800 block of Callfield. The 29-year-old male driver was placed under arrest. He was transported to the Wichita County Detention Center and was charged with Failure to Identify-False Information and Fail to Display Drivers License. On Saturday July 25, at approximately 2:30 am, Deputy Christopher Ramos made a traffic stop in the 2500 block of Marie. The 27-year-old male driver was placed under arrest. He was transported to the Wichita County Detention Center and was charged with Driving While Intoxicated-Enhanced. On Saturday July 25, at approximately 2:19 am, Corporal Ralph Burdick and Deputy Brandon Mason responded to the 7700 block of Seymour Hwy. in reference to a Disturbance. Upon arrival, the Reporting Person reported that she had been assaulted by a family member. On Saturday July 25, at approximately 1:19 pm, Deputy Lance Brumley and Deputy John Warner responded to the 1400 block of Hwy. 79 north in reference to a Theft. Upon arrival, the Reporting Person reported that an unknown person(s) stole $4,000.00 in currency from the residence. On Saturday July 25, at approximately 2:01 am, Deputy Todd Kinsey made a traffic stop in the 2600 block of Ave F. The 21-year-old male driver was placed under arrest. He was transported to the Wichita County Detention Center and was charged with Driving While Intoxicated-Enhanced. On Saturday July 25, at approximately 10:46 pm, Corporal Ralph Burdick checked out a person that was walking at the intersection of F.M. 369 and Kell Blvd. The 38-year-old male was placed under arrest. He was transported to the Wichita County Detention Center and was charged with Possession of a Controlled Substance PG 3 under twenty-one grams. On Sunday July 26, at approximately 8:47 pm, Deputy Roy Biter made a traffic stop at the intersection of North Burnett and North 4th. The 17-year-old male driver was placed under arrest. He was transported to the Wichita County Detention Center and was charged with an outstanding warrant for Capias Pro Fine-Speeding 76/60 and was issued a citation for Possession of Drug Paraphernalia. On Sunday July 26, at approximately 1:04 am, Deputy Todd Kinsey attempted to stop a vehicle at the intersection of Midwestern Pkwy. and Taft. The vehicle was finally stopped at the intersection of Taft and Kell. The 26-year-old male driver was placed under arrest. He was transported to the Wichita County Detention Center and was charged with Evading Arrest or Detention with a Motor Vehicle and an outstanding warrant for Evading Arrest. On Sunday July 26, at approximately 1:34 pm, Deputy Lance Brumley and Deputy John Warner responded to the 2000 block of Hampton Road in reference to an Abandoned Vehicle. Upon arrival, the vehicle was impounded after the owner could not be contacted. On Sunday July 26, at approximately 2:17 am, Deputy Greg Wilson made a traffic stop in the 500 block of Central Frwy. The 22-year-old male driver was placed under arrest. He was transported to the Wichita County Detention Center and was charged with Driving While Intoxicated-Enhanced. On Monday July 27, at approximately 4:39 am, Deputy Brandon Mason made a traffic stop at the intersection of Kell West and Sherman. The 25-year-old male driver was placed under arrest. He was transported to the Wichita County Detention Center and was charged with Driving While Intoxicated-Enhanced. 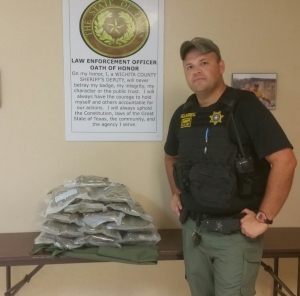 On Thursday July 23, at approximately 8:36 am, Deputy Gabriel Villarreal made a traffic stop at the intersection of U.S. 287 and County Line Road. The 25-year-old female driver was placed under arrest. She was transported to the Wichita County Detention Center and was charged with Possession of a Controlled Substance PG 2 over four grams under 400 grams. On Thursday July 23, at approximately 148 am, Deputy Patrick Bradford and Deputy Jeff Lee responded to the 2000 block of Clark Road in reference to a Theft. Upon arrival, the Reporting Person reported that an unknown person(s) stole a chainsaw, four pigeon traps and 100 pigeons valued at $500.00. On Friday July 24, at approximately 12:59 am, Deputy Greg Wilson made a traffic stop in the 3700 block of Callfield Road. The 30-year-old male driver was placed under arrest. He was transported to the Wichita County Detention Center and was charged with Driving While Intoxicated. On Friday July 24, at approximately 10:44 pm, Deputy Chris Barnett made a traffic stop at the intersection of 10th and Kemp. The 23-year-old male driver was placed under arrest. He was transported to the Wichita County Detention Center and was charged with Possession of a Controlled Substance PG 1 under one gram, Possession of Marijuana under two ounces, Fail to Identify/Fugitive from Justice and an outstanding warrant for a Parole Violation. On Wednesday July 22, at approximately 11:11 pm, Deputy John Warner stopped an individual that was walking in an alley in the 3100 block of Sherwood. The 18-year-old male was placed under arrest. He was transported to the Wichita County Detention Center and was charged with Violation of Protective Order. On Wednesday July 22, at approximately 2:26 am, Corporal Ralph Burdick attempted to stop a vehicle on F.M. 369 near the intersection of F.M. 367. The vehicle failed to stop and was pursued on F.M. 369, Southwest Parkway, Henry S. Grace Freeway, and U.S. 287 into Clay County, U.S. 82, Spur 510 and then struck a fence at the intersection of Spur 510 and U.S. 287. The driver fled the scene on foot. The 26-year-old male passenger, Brandon Alexander Gilleland, was placed under arrest. The 21-year-old male driver, Gartin Landon Tumey, was placed under arrest several hours later at the intersection of Gun Club Road and F.M. 2847. The subjects were later transported to the Wichita County Detention Center. The driver was charged with Theft over $20,000.00 under $100,000.00 and Evading Arrest or Detention with a Vehicle. The passenger was charged with Theft over $20,000.00 under $100,000.00. The vehicle was found to have been stolen from Burkburnett. On Monday July 20, at approximately 5:58 pm, Deputy Gerald Morgan responded to the 12100 block of McFall Road in reference to a Scam. Upon arrival, the Reporting Person reported that she lost $399.25 in a telephone scam. On Tuesday July 21, at approximately 10:10 am, Deputy Victoria Hatcher and Deputy John Warner made a traffic stop in the 400 block of North Scott. The 23-year-old male driver was placed under arrest. He was transported to the Wichita County Detention Center and was charged with Driving While License Invalid. On Tuesday July 21, at approximately 6:40 pm, Deputy Brett Brasher responded to the 11600 block of F.M. 368 South in reference to an Animal Complaint. Upon arrival, the Reporting Person reported that he was bitten by a dog while riding his bicycle. On Tuesday July 21, at approximately 2:40 pm, Deputy Brett Brasher responded to the 1200 block of Old State Road in reference to an Animal Complaint. Upon arrival, the Reporting Person reported that he was bitten by a dog while riding his bicycle. On Tuesday July 21, at approximately 12:52 pm, Sergeant Sergio Teruel and Deputy Jeff Lee responded to the 6100 block of F.M. 368 in reference to an Animal Complaint. Upon arrival an abandoned dog was located. Animal Control was contacted and upon their arrival, the animal was impounded. On Thursday July 16, at approximately 10:25 am, Deputy Gabriel Villarreal made a traffic stop at the intersection of U.S. 287 and Harmony Road. The 20-year-old male driver and two 22-year-old male passengers were placed under arrest. They were transported to the Wichita County Detention Center. They were charged with Possession of Marijuana over five pounds under fifty pounds and Possession of a Controlled Substance PG 2 over four grams under four hundred grams. One of the 22-year-old males was also charged with an outstanding Florida Warrant for Threat to Kill. Five pounds of high grade marijuana and five grams of hashish were seized. On Wednesday July 15, at approximately 1:22 am, Deputy Todd Kinsey made a traffic stop in the 1700 block of 10th Street. The 28-year-old male driver was placed under arrest. He was transported to the Wichita County Detention Center and was charged with three outstanding warrants for Failure to Stop at Designated Point, No Drivers License in Possession and Failure to Maintain Financial Responsibility. On Thursday July 16, at approximately 2:47 am, Sergeant Mark Whipple and Deputy David Stout checked on an unoccupied vehicle in the 1200 block of Central Frwy. A 33-year-old male was placed under arrest. He was transported to the Wichita County Detention Center and was charged with an outstanding warrant for Speeding 75/60. On Thursday July 16, at approximately 2:02 pm, Deputy Greg Wilson responded to the 6400 block of Bacon Switch Road in reference to an Animal Complaint. Upon arrival, the Reporting Person reported that a horse and a donkey were found on the roadway and that he could not locate the owner. The animals were impounded. On Friday July 17, at approximately 2:36 am, Deputy Todd Kinsey made a traffic stop in the 3600 block of Maplewood. A 19-year-old female passenger was placed under arrest. She was transported to the Wichita County Detention Center and was charged with Possession of Marijuana under two ounces and Unlawful Carrying of Firearm. 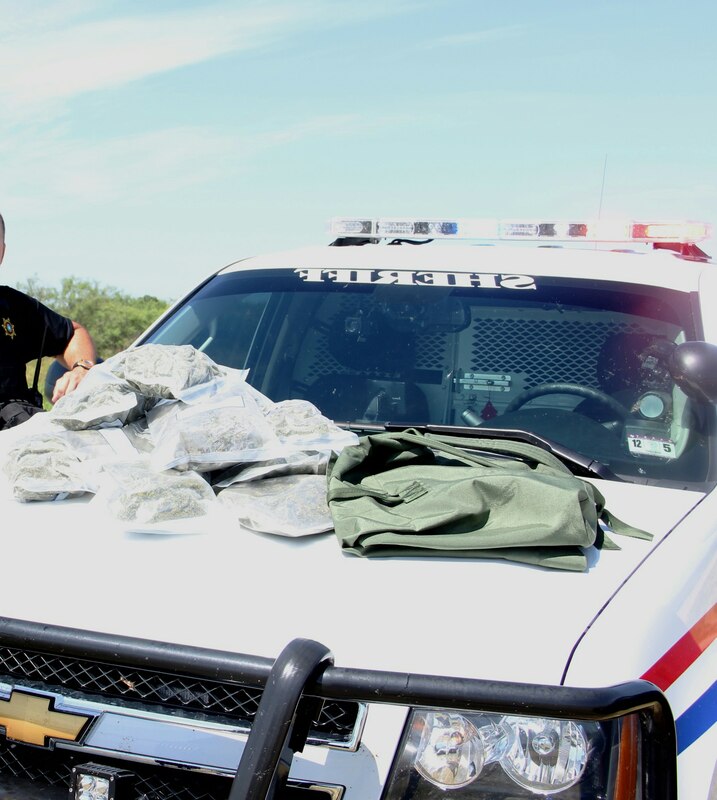 On Friday July 17, at approximately 2:10 pm, Deputy Victoria Hatcher made a traffic stop at the intersection of Burkburnett Road and Airport Drive. The 26-year-old male driver and a 25-year-old female passenger were placed under arrest. They were transported to the Wichita County Detention Center. The Driver was charged with an outstanding warrant for Theft of Service over $1,500.00 under $20,000.00. The passenger was charged with four outstanding warrants for Theft of Service over $1,500.00 under $20,000.00, Fail to Obtain Dog/Cat License, No Current Vaccination for Animal and two counts of No Drivers License in Possession. On Friday July 17, at approximately 11:52 pm, Deputy Chris Barnett made a traffic stop at the intersection of Central Frwy. and Maurine Street. The 44-year-old male driver was placed under arrest. He was transported to the Wichita County Detention Center and was charged with Driving While Intoxicated-Enhanced. On Saturday July 18, at approximately 2:48 pm, Sergeant Sergio Teruel, Deputy Patrick Bradford and Deputy Jeff Lee responded to the 3300 block of F.M. 367 in reference to Harassment. Upon arrival, the Reporting Person reported that unknown person(s) are driving by his residence taking photographs. On Saturday July 18, at approximately 8:37 am, Deputy Victoria Hatcher responded to the 1600 block of River Road in reference to Harassment. Upon arrival, the Reporting Person reported that she has been receiving harassing telephone calls and text messages from a subject. On Saturday July 18, at approximately 6:13 am, Deputy Todd Kinsey and Deputy Brandon Mason responded to the 2100 block of Hwy. 79 in reference to a Burglary of a Building. Upon arrival, the Reporting Person reported that an unknown person(s) pried open a door to a storage building and entered. On Saturday July 18, 9:59 pm, Sergeant Carl Magee, Deputy Chris Salas and Deputy Roy Biter responded to the 7000 block of Seymour Hwy. in reference to a Disturbance. Upon arrival, the Reporting Person reported that there had been a physical disturbance at the address prior to Deputies arrival. On Sunday July 19, at approximately 6:45 am, Corporal Lee Crossman and Deputy Chris Salas responded to the 15000 block of S.H. 240 in reference to a Theft. Upon arrival, the Reporting Person reported that several pieces of lawn equipment and numerous tools valued at $16,927.00 were stolen from a storage building. On Sunday July 19, at approximately 8:20 pm, Deputy Cole McGarry and Deputy Roy Biter responded to Wellington Lane in reference to an Animal Complaint. Upon arrival, the Reporting Person reported that two aggressive dogs appeared on the property. Animal Control was contacted and upon their arrival, they were impounded. On Tuesday July 14, at approximately 9:21 am, Deputy John Warner and Deputy Jeff Lee responded to the Iowa Park Police Department in reference to an Animal Complaint. Upon arrival, the Reporting Person reported that two dogs had been picked up in the area of Cindy Lane and Iowa Park Road and were found to be in need of care. On Wednesday July 15, at approximately 1:30 am, Sergeant Mark Whipple made a traffic stop in the 2000 block of Grant. The 18-year-old male driver was placed under arrest. He was transported to the Wichita County Detention Center and was charged with Possession of Marijuana under two ounces. On Wednesday July 15, at approximately 11:43 pm, Deputy Chris Barnett made a traffic stop at the intersection of Farris and 2nd Street. The 51-year-old male driver was placed under arrest. He was transported to the Wichita County Detention Center and was charged with three outstanding warrants for Capias Pro Fine-Open Container in Vehicle, Capias Pro Fine-Violate Promise to Appear and Consumption of Alcohol on premise with off premise permit. On Wednesday July 15, at approximately 10:12 pm, Deputy Kristian Valdez made a traffic stop at the intersection of Seymour Hwy. and Sunset. The 31-year-old female driver was issued tow citations for No Drivers License and Fail to Maintain Financial Responsibility. On Wednesday July 15, at approximately 8:25 am, Deputy Jeff Lee and Lieutenant Patrick McFerrin responded to River Bottom Road in reference to a Burglary of a Motor Vehicle. Upon arrival, the Reporting Person reported that an unknown person(s) entered the property and stole a LED light bar valued at $350.00, an Optima Battery valued at $300.00, two vehicle ramps valued at $50.00, damaged five windows and dented a passenger door on a vehicle. On Wednesday July 15, at approximately 3:35 pm, Corporal Lee Crossman made a traffic stop in the 100 block of East Scott. The 71-year-old male driver was placed under arrest. He was transported to the Wichita County Detention Center and was charged Driving While Intoxicated. On Wednesday July 15, at approximately 2:15 pm, Deputy Jeff Lee and Deputy John Warner responded to the 2800 block of Lebanon to serve an arrest warrant. Upon arrival, the 48-year-old female was placed under arrest. She was transported to the Wichita County Detention Center and was charged with Violation of Probation/Abandon Endanger Child/Criminal Negligence. On Thursday July 16, at approximately 2:27 am, Corporal Ralph Burdick made a traffic stop in the 1200 block of North Central Frwy. The 39-year-old male driver was placed under arrest. He was transported to the Wichita County Detention Center and was charged with Driving While License Invalid and Possession of a Controlled Substance PG 1 over one gram under four grams. On Thursday July 16, at approximately 12:18 am, Sergeant Mark Whipple made a traffic stop on an occupied vehicle in the 1000 block of North Scott. The 49-year old male driver and a 32-year-old female passenger were placed under arrest. They were transported to the Wichita County Detention Center. The driver was charged with Public Intoxication. The passenger was charged with an outstanding warrant for4 Open Container Violation. On Thursday July 16, at approximately 10:15 am, Lieutenant Patrick McFerrin responded to the 3200 block of Kincall Road in reference to a Theft. Upon arrival, the Reporting Person reported that a subject stole a Samsung Galaxy S 5 Phone valued at $600.00 and a T-Mobile Phone Booster. On Tuesday July 7, at approximately 12:27 pm, Deputy John Warner and Deputy Jeff Lee responded to the 600 block of Turkey Ranch Road in reference to a Criminal Mischief. Upon arrival, the Reporting Person reported that an unknown person(s) damaged a mailbox valued at $150.00 that is located on the property. On Wednesday July 8, at approximately 12:46 am, Deputy Todd Kinsey made a traffic stop in the 4000 block of Taft. The 31-year-old male driver was placed under arrest. He was transported to the Wichita County Detention Center and was charged with Driving While License Invalid. On Wednesday July 8, at approximately 4:18 pm, Lieutenant William Rutledge and Sergeant Carl Magee responded to the 9600 block of Riverview in reference to a Medical Call. Upon arrival, a 62-year-old female was found deceased of natural causes. On Thursday July 9, at approximately 12:57 am, Deputy Brandon Mason made a traffic stop in the 1100 block of Central Freeway East. The 30-year-old male driver was placed under arrest. He was transported to the Wichita County Detention Center and was charged with Driving While Intoxicated. On Thursday July 9, at approximately 12:16 am, Deputy Lance Brumley made a traffic stop in the 500 block of White. The 42-year-old male driver was placed under arrest. He was transported to the Wichita County Detention Center and was charged with two outstanding warrants for Capias Pro Fine Driving While Intoxicated and Fail to Signal Turn. On Thursday July 9, at approximately 12:38 am, Corporal Ralph Burdick made a traffic stop in the 500 block of Van Buren. The 31-year-old male driver was placed under arrest. He was transported to the Wichita County Detention Center and was charged with Driving While License Invalid-Enhanced. On Thursday July 9, at approximately 3:39 pm, Deputy Kristian Valdez responded to the 900 block of 7th Street in reference to a Credit Card Abuse. Upon arrival, the Reporting Person reported that an unknown person(s) made an unauthorized purchase in the amount of $150.00 on her Credit Card. On Friday July 10, at approximately 4:08 pm, Deputy Kristian Valdez and Deputy Cole McGarry responded to the 100 block of Rifle Range Road in reference to an Animal Complaint. Upon arrival, the Reporting Person reported that she had been bitten by a cat. On Friday July 10, at approximately 10:08 am, Deputy Cole McGarry made a traffic stop in the 1400 block of Hwy. 79 North. The 28-year-old male driver was placed under arrest. He was transported to the Wichita County Detention Center and was charged with Possession of a Dangerous Drug. On Friday July 10, at approximately 1:45 am, Sergeant Mark Whipple made a traffic stop in the 300 block of North Scott. The 38-year old male driver was placed under arrest. He was transported to the Wichita County Detention Center and was charged with Driving While Intoxicated. On Friday July 10, at approximately 12:05 pm, Sergeant Sergio Teruel, Deputy Joe Gallego and Deputy Scott Chapel responded to the 1900 block of Ardath to serve a Mental Health Warrant. Upon arrival, a 76-year-old male was placed under arrest. He was transported to the Red River Hospital and was admitted. On Friday July 10, at approximately 2:54 am, Deputy Brett Brasher made a traffic stop in the 3100 block of Kemp Blvd. The 32-year-old male driver was placed under arrest. He was transported to the Wichita County Detention Center and was charged with two outstanding warrants for Criminal Trespass and Public Intoxication. On Saturday July 11, at approximately 11:06 pm, Sergeant Mark Whipple made a traffic stop in the 1000 block of Central Frwy. A 17-year-old female passenger was issued a citation for Possession of Drug Paraphernalia. On Saturday July 11, at approximately 2:47 pm, Deputy Victoria Hatcher responded to Bacon Switch Road and Peterson Road in reference to a grass fire. Upon arrival, the Reporting Person reported that he had gotten his vehicle stuck in a wheat field which ignited the field and the vehicle. On Saturday July 11, at approximately 10:37 am, Deputy Victoria Hatcher responded to the 1000 block of Wylie Road in reference to a Theft. Upon arrival, the Reporting Person reported that an unknown person(s) entered the property and stole a game camera valued at $150.00 from a pole. On Saturday July 11, at approximately 9:52 am, Deputy Greg Wilson responded to the 3300 block Watts Road in reference to an Animal Complaint. Upon arrival, the Reporting Person reported that two dogs appeared on his property and attacked his cattle. On Sunday July 12, at approximately 6:32 am, Deputy Lance Brumley, Deputy David Stout and Deputy Chris Ramos responded to the 4000 block of F.M. 368 in reference to a Family Disturbance. Upon arrival, a 58-year-old male was placed under arrest. He was transported to the Wichita County Detention Center and was charged with Assault/Family Violence, Interference with Emergency Telephone Call and three outstanding warrants for Capias Pro Fine-Display Expired License Plates, Capias Pro Fine-Failure to Appear, Capias Pro Fine-Driving While License Invalid and Capias Pro Fine-Speeding 83/60. On Sunday July 12, at approximately 3:50 am, Corporal Lee Crossman made a traffic stop at the intersection of Seymour Hwy. and Barnett Road. A credit card was seized from the vehicle for preventing consequences of theft. On Monday July 6, at approximately 8:33 pm, Deputy Gerald Morgan responded to the 4200 block of River Road in reference to a Theft. Upon arrival, the Reporting Person reported that a subject stole a Seiko Wall Clock valued at $100.00 from her residence. On Monday July 6, at approximately 10:16 pm, Deputy Cole McGarry made a traffic stop in the 2400 block of Kemp. The 21-year-old male driver was placed under arrest. He was transported to the Wichita County Detention Center and was charged with an outstanding warrant for Possession of Marijuana under two ounces. On Monday July 6, at approximately 1:10 pm, Deputy John Warner and Deputy Jeff Lee made a traffic stop at the intersection of Jefferson and Bridge. The 28-year-old female driver was placed under arrest. She was transported to the Wichita County Detention Center and was charged with Driving While License In invalid with previous conviction and an outstanding warrant for no drivers license in possession. On Monday July 6, at approximately 11:47 am, Lieutenant Patrick McFerrin and Deputy Victoria Hatcher responded to the 400 block of Dove Lane in reference to the recovery of a stolen vehicle. Upon arrival, the vehicle was recovered and released to the owner.